Dream, Create, Inspire: I Won! I won this sweet little handpainted and soldered charm from Laurie over at Laurie's Charming Designs. The reverse side features the word NEST on it. Isn't it darling? 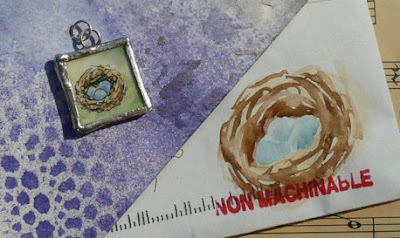 And don't you love how she added the watercolored nest on the front of her envelope. I love little touches to detail like that. Thank you SO much Laurie!!! I just finished making seven of these keychains for the bridesmaids (and the bride) who are standing up to my daughter's wedding. Along with the necklace and earrings I am making for them to wear to the wedding, she is giving them these keychains and a Vera Bradley bag in this pattern. The charm is so absolutely gorgeous! And your keychains are absolutely wonderful!!!!! Those lucky girls to get the keychain and a Vera Bradley bag!!!! That key chain is so great! Love it and they will too! Just wanted to tell ya all the teachers loved there canvas's. adorable. Congratulations for that nice pendant.